Hmm, how do I begin? 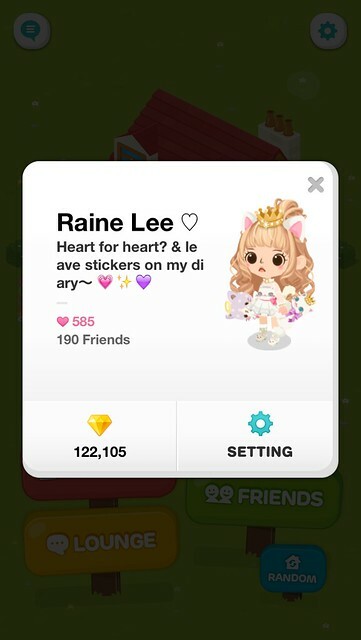 LinePLAY is an app on the iPhone. A game where you can create an avatar that looks like you (or not) & dress them up in the latest fashion. You also have your very own house which you can decorate w furniture & other stuff. New themed items will be released every week & yada yada yada. Smtg like The Sims except you can't do stuff with/to other avatars, sadly. & you can't go to the gym, have pets & whatnot like The Sims could. But you can eat, soak in the bathtub, water plants & clean dust that's all LOL I feel childish just by saying this. But but.. it's very cute okay! I installed it right away when I saw the screenshot. Plus you can add people, send them hearts, visit their houses, give them gifts, & talk to them. There are also live chatrooms where you can make conversation w people from all around the world. I was addicted to it for awhile, that even my friends had to tell me to put my phone away when I was out w them. They tried grabbing my phone too wtf. Later on I intro-ed it to Wei Kit & he also ended up QUITE the same. Then our friends shake their heads at us in disappointment. They surrender hahaha. When Dave talks to me he said he was like talking to the wall lol. I can't control myself when I'm addicted to any game, I won't choi ppl one. Long ago when I played MapleStory I didn't wna go outta the hse at all (~_~;) I'm always busy chiong-ing, PQ-ing, hanging out at the free market or camping at some place doing ntg but still duwanna leave the computer seat. Sigh. I even ate my meals on the computer table, & didn't sleep. The only time I'm not at that spot is when I go & take a shower wtf. My dad had to plug out the desktop cables sumore, cos I duwanna go to bed & thr's school the next day (I was still in high sch that time). Oh, memories. You won't wna know the rest of the story anyways. 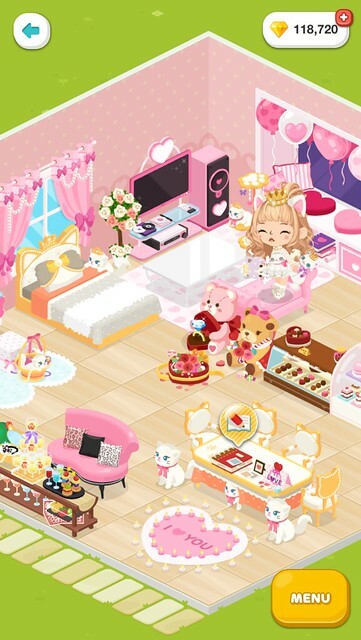 But LinePLAY not so bad lah, I give up alrdy lol! Decorated my house just once then I felt lazy to add anymore things or rearrange. I still do open the app everyday thou, to check if ppl sent me hearts or left stickers on my diary & that's it. 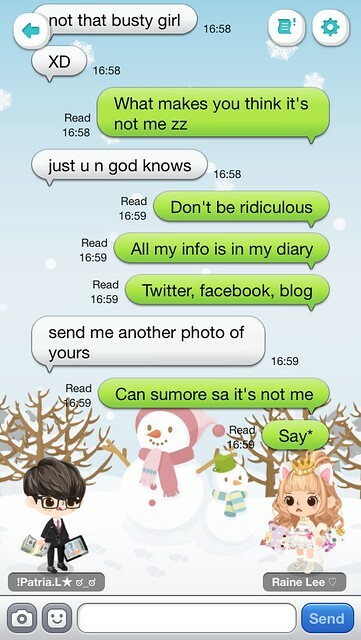 Kk, so you can picture how it actually looks like..
Lolll act kawaii max. I honestly didn't see another avatar w the same sad smile lol. Okay so, I was happily doing my thing, minding my own business, till one fine day I was bored & went into one of the chatrooms & requested to exchange hearts w the players there. Some sent me hearts & I returned (although I was a bit late, like 10 mins?) till I suddenly saw.. 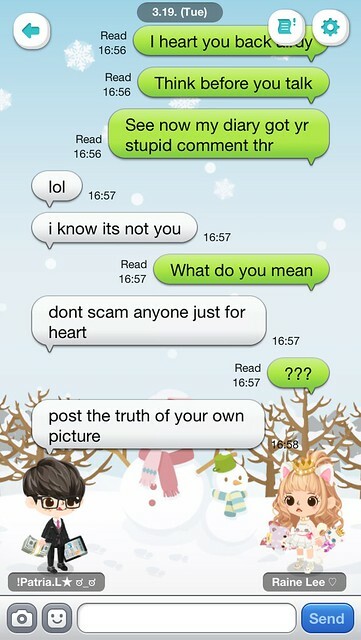 I checked & I saw that I did return the heart, so I was wondering why he'd call me a scammer. Felt a little mad so I decided to PM him. I could, bcos he added me as a friend beforehand. *first bubble says I heart you back ady* I was STILL confused. + there was another incident that I'm not gna show, later you all vomit on yr screens. 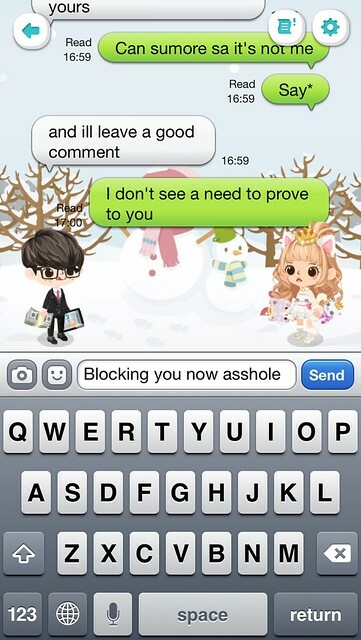 I didn't know that LinePLAY also can have so much drama. Thanks to these jerks. Off to bed. Can't believe I'm saying I'm tired at 2.30AM. Been sleeping earlier than usual nowadays & trying to go to work everyday. Goodnight! Initially an emo post but I decided to remove everything several days after.